The name's Django. 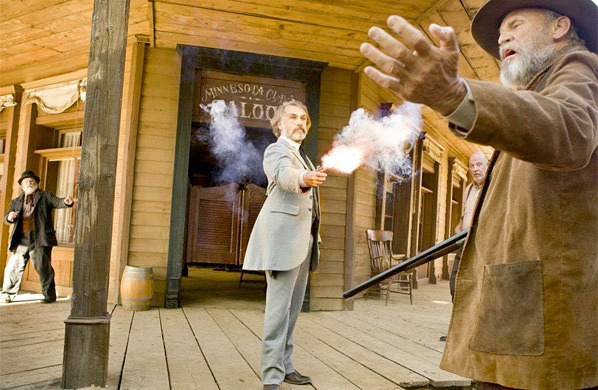 Although we're anxiously awaiting the first teaser trailer for Quentin Tarantino's new spaghetti western Django Unchained, supposedly playing with Prometheus, another batch of new photos have arrived to whet our appetite and keep us excited. 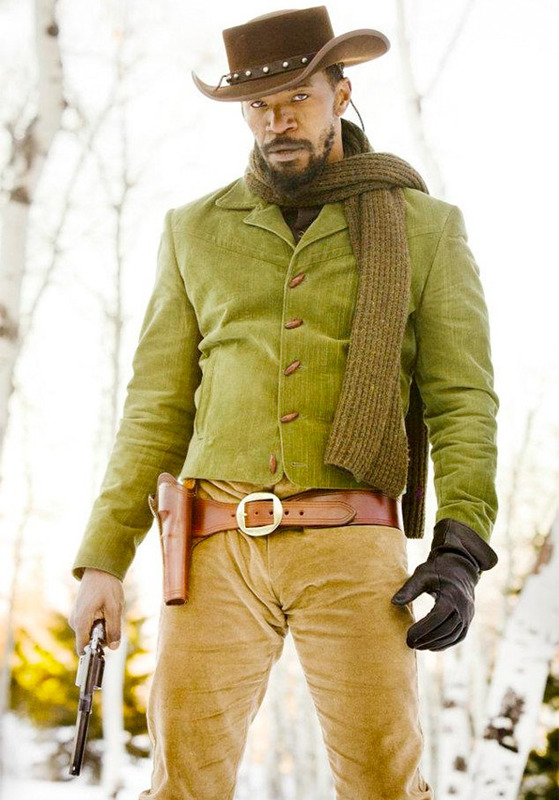 This time we get better looks at Jamie Foxx as the freed slave-turned-bounty hunter Django, as well as a second look at Christoph Waltz as bounty hunter Dr. King Schultz (shooting someone), who trains him. There's a few more shots of Leonardo DiCaprio as plantation owner Calvin Candie as well (to compliment the original first look), so check them all out below. These were found in high res by The Film Stage on Facebook, but they're also in the latest Empire, too. This will be totally awesome.. Tarantino is back..
Dude seriously: what the heck did you just say???? I think this was copied from Google translator. I only laughed because it sounded like this drunk guy who lives around my house. wait... there is a drunk guy that lives around your house? Have you not seen The Assassination of Jesse James by the Coward Robert Ford? I said original duds, read the commen again 3:10 to Yuma , Appalosa , True Grit and Even Jesse James were remade. You don't read my commen exactly. Tarantino bring the dead to the life!!!!!!!!!!!!!!!!!!!! Actually Ehsan, I believe Appaloosa and Assassination of Jesse James were both originals - not remakes. Can't wait to see it either. Agree. But I dig the saturated colors. Yeah, Tarantino and Richardson should have gone full on D.W. Griffith, Birth of a Nation! (Edison cameras, and no sound, not just the language of cinema.) LOL. These are still photographs from the on-set photographer... and I bet you he shoots on a Canon or Nikon. I love the third picture "Dude.... ya shot me." I want some moving pictures! Moving pictures you say?! UNHEARD OF! Harry Potter. The Daily Prophet. Gimme a trailer!!! Seriously, is that Little Joe Cartwright's jacket? Awesome! I want to know where the Asian people are at, and that's all I want to know. Probably building a railroads somewhere. Or hanging out in an opium tent. im interested in seeing how much homage he'll play to classic westerns.. I may have to chain myself down (pun intended?). That's how excited I am for this film. Man, they all look way too clean. I have a bad feeling about this. 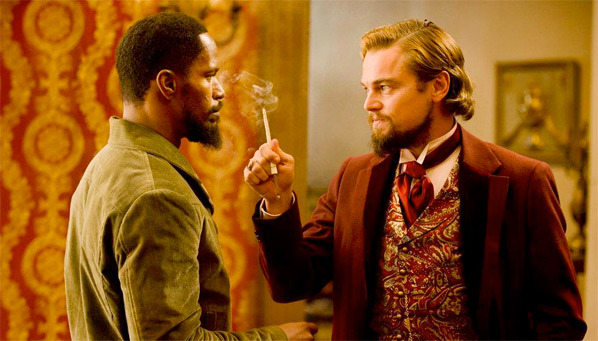 Django 2012 (Jamie Foxx) y Django 1966 (Franco Nero)! I doubt that sir. I think this is name deja vu. I think Tarantino wright original script for this. I love whole of those remakes too very much(exceptionally cowboy vs alien) unfortunately I didn't see django 1966, I try to see that. Beside if this was true , don't interrupt my comment or show it is false because in that shape (cup of western run out of original ideas, and this mean western was dead to me, I really can't wait for release this with I do respect for your opinion. Django 66 was pretty damn enjoyable, I think you'll dig it. I agree with Richard Canlas up there. I LOVE Tarantino and everything he does, but the cleanliness of everything is worrying me a bit. I'm not a fan of the old Hollywood westerns, the Italian-made are the ones I love. Dirty and gritty. But I know it won't disappoint. Except for The Terror of Tiny Town. Now THAT'S a classic western! !